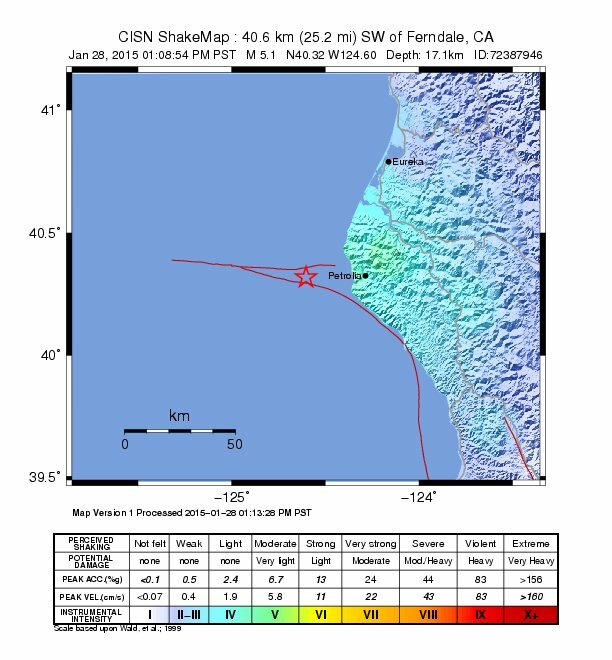 We just had a good sized shaker, probably on the Mendocino fault system. Today’s earthquake occurred on 1/28/2015 at 1:08 local time. 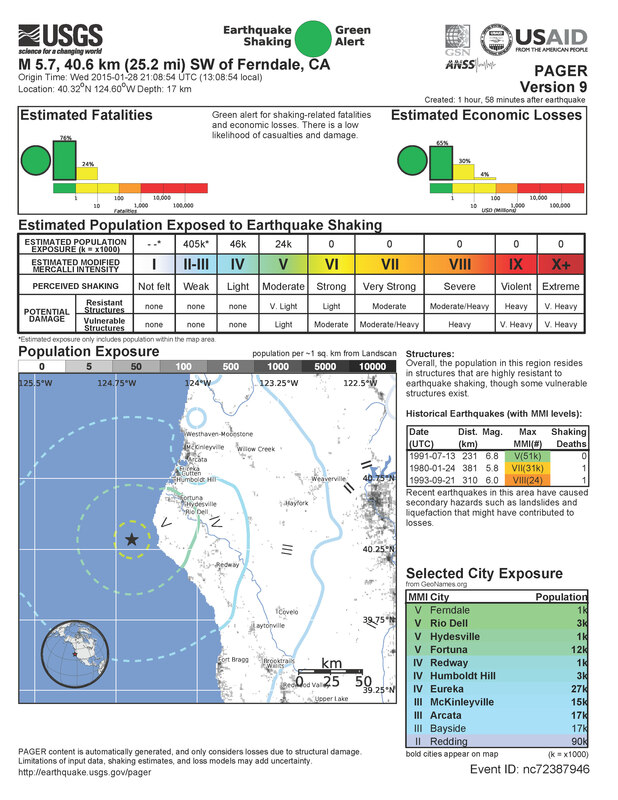 The mainshock, an earthquake of magnitude Mw = 5.7, has an epicenter approximately 20 km due west of the mouth of the Mattole River. Please check back here soon as I am updating this page rapidly. I have now plotted one of the foreshocks in my interpretation figure below, a magnitude 3.2 earthquake that plots west of the Mw 5.7 mainshock. The M 3.2 happened on 1/25/15. We do NOT expect a tsunami from this earthquake. The magnitude is small and the type of earthquake is strike slip. According to the NCSS, there is a high likelihood of aftershocks. Read their statement here. Here is a map showing the mainshock (the largest orange dot). The USGS active faults are also shown. There is also a big red dot, but that is plotted incorrectly. Here is a more localized map, showing the shape of the seafloor as it relates to the deformation of the Mendocino Transform fault plate boundary. The Mendocino fault is a right-lateral strike-slip fault that separates the Gorda plate to the north from the Pacific plate to the south. Here is a map with some interpretations plotted on it. I have labeled the three plate boundary faults along with their sense of motion. I have also placed the moment tensor of the Mw 5.7 main shock on this map. I have drawn two red lines of possible faults that may be responsible for for the earthquakes that ruptured today. 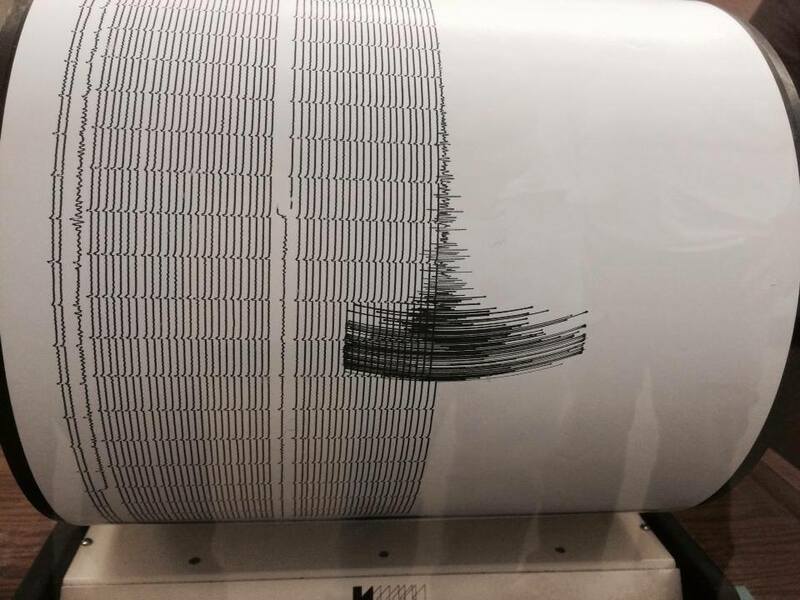 Here is a photo of the HSU Dept of Geology Seismograph. Here is the regional map with the Did You Feel It shaking intensity data plotted. Please go to the USGS website to register your observations here. Your observations help us learn about the local geology. Here is the moment tensor for this earthquake. 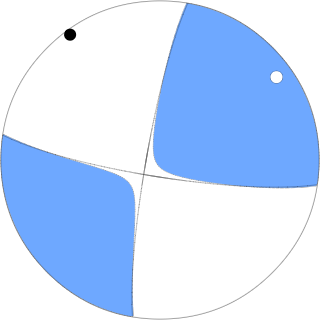 This is interpreted to be a strike slip earthquake based on this moment tensor. This is the automated map showing expected Modified Mercalli Shaking Intensities for this earthquake. This is simply based on a model, while the DYFI map is actually based upon people’s observations (like yours!). This DYFI map shows that people in Chico, California felt this earthquake! The earthquake was also felt in Oregon! Updated at 4:45 local time. Here is the “PAGER” page that shows a modeled estimate of loss of human lives and their possessions (like buildings). There is actually a 24% likelihood that there may be between 1 and 10 fatalities! This is a map showing the plate configuration of our region. 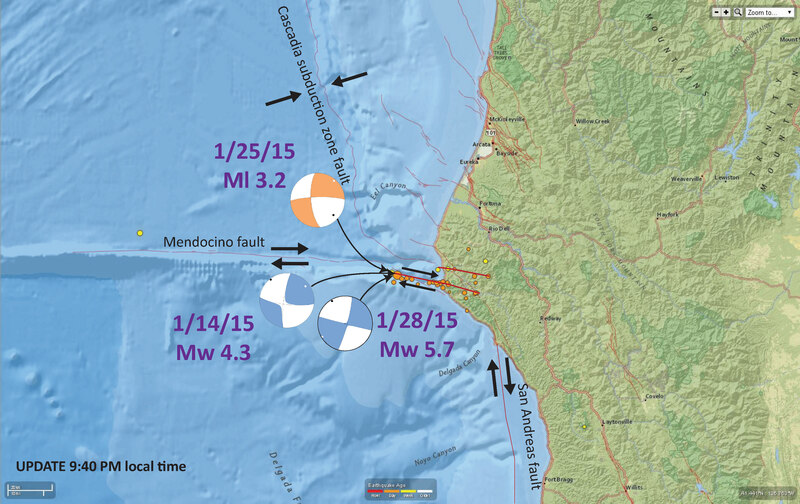 Today’s earthquake probably occurred along the Mendocino fault system. 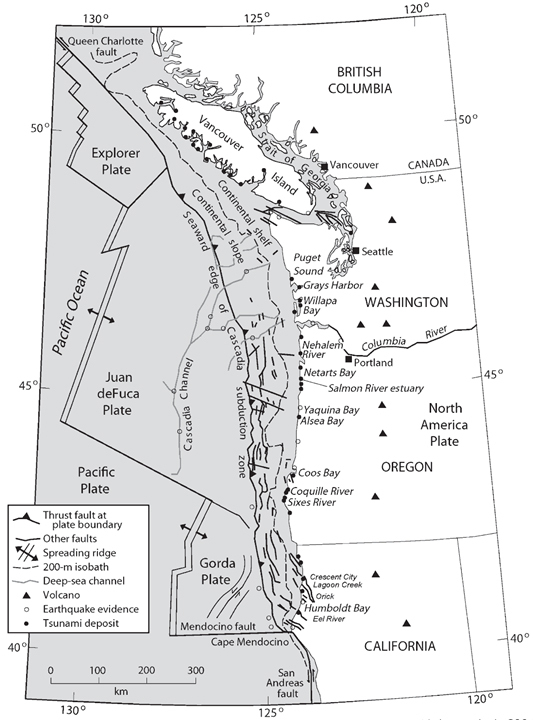 There is more information about the Cascadia subduction zone here. From Nelson et al., 2006. 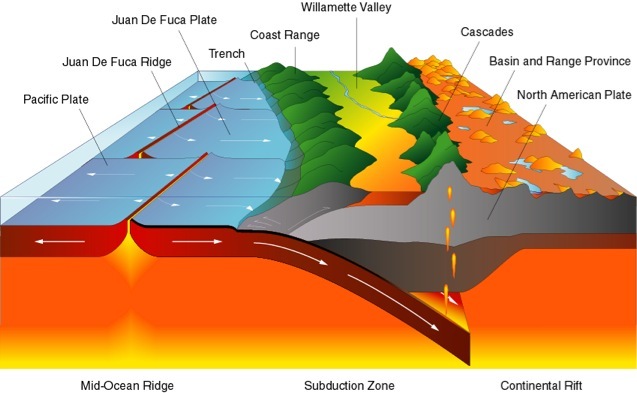 This shows a cross section and map view of the Cascadia subduction zone. There are other transform faults further north (e.g. the Blanco fracture zone), which are similar to the Mendocino fault. This cross section is at the latitude of the southern Willamette Valley. Here is a map from Rollins and Stein (2010) that shows historic earthquakes in the Mendocino triple junction region. The earthquakes in 1994 and 1983 were also in the Mendocino fault. The 1983 swarm occurred in the same region as today’s Mw 5.7 swarm. 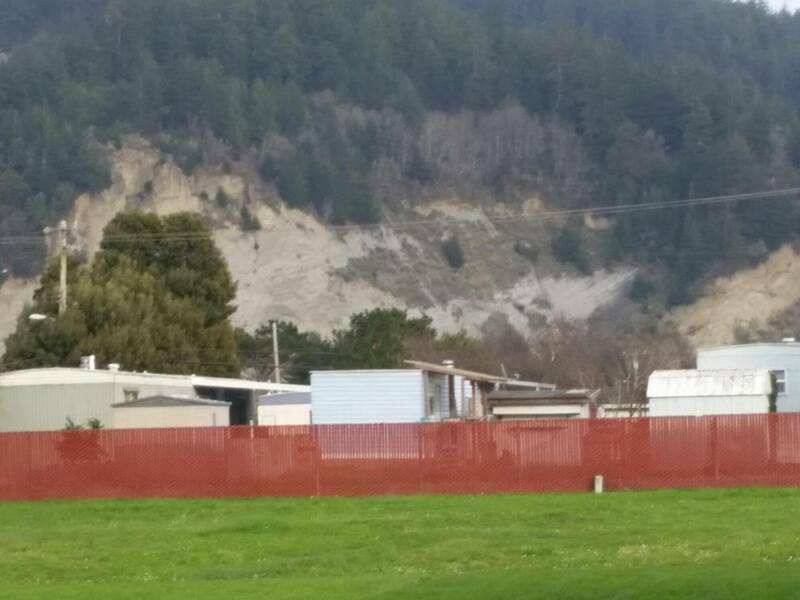 Here is a photo of the Rio Dell Bluffs taken by Mary Lou Willits today. According to her, the cliffs that are colored grey were newly exposed today (compared to the yellowish cliffs to the right). Rollins, J. C., and Stein, R. S., 2010, Coulomb Stress Interactions Among M ≥ 5.9 Earthquakes in the Gorda Deformation Zone and on the Mendocino Fault Zone, Cascadia Subduction Zone, and Northern San Andreas Fault: Journal of Geophysical Research, v. 115, no. B12306, p. 19 pp. we felt it off Broadway and Wabash in Eureka. Fun little roller. I had major swaying and rattling here in Sunny Brae. One thing swayed for 10 minutes. Thanks for the shoutouts man! thanks chris, that paper is a gold mine for eye candy…. I had fun near Weott watching the electronic level tilt on a total station survey instrument, swinging for a nearly a minute!